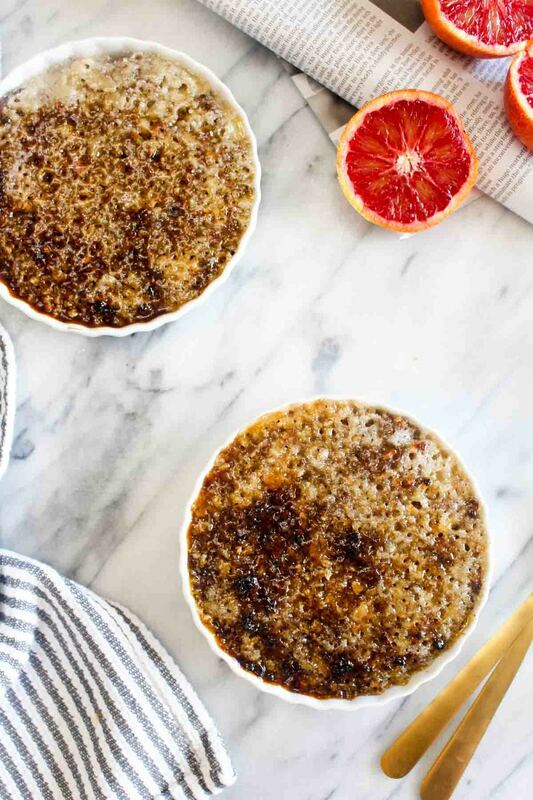 This Coffee Steel Cut Oatmeal Brulee is like having your morning coffee, breakfast, and dessert all in one! This recipe is easier than you might think. Add the coffee, coconut milk, water, maple syrup, coconut sugar, and salt into a saucepan. Heat over medium-high heat until the mixture boils. Stir in the oats and bring it back up to a simmer. Lower the heat to just maintain the simmer and cover. Cook for 10 minutes. Remove the lid and stir the oats. Simmer, stirring occasionally, for another 10 minutes, uncovered. Remove the oats from the heat and stir in the arrowroot starch mixture. Return it to the heat and bring it back up to a simmer. Once the mixture has thickened, about 1 minute. Remove it from the heat and ladle it into ramekins. Set your broiler to high and top each ramekin with sugar. Place the ramekin on a baking tray and place them on the top rack of the oven. Broil, watching constantly, until they tops begin to brown deeply. Remove from the oven and allow to cool until the molten sugar has hardened. Serve.